GEORGE TOWN - Sea-level rise, greenhouse gas emissions, droughts and extreme precipitation all broke records again last year, according to information published this week in the ‘State of the Climate in 2017‘, an annual report by NOAA’s Center for Weather and Climate, with input from more than 500 scientists and experts from 65 countries. Once again, the findings of the researchers paint a bleak picture for the planet and the very clear trends and increasing numbers of extreme weather events. 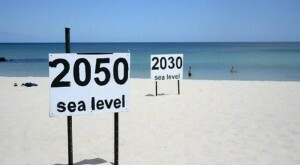 But one of the most important revelations in the report for the Caribbean is the continued sea-level rise. 2017 marks the sixth consecutive year of sea-level rise. Although there is some global fluctuation, the oceans are now more than three inches higher than they were in 1993. The experts found that along the east coast of North America, sea levels were all anomalously high last year and oceanic heat content also rose on a global scale in 2017. For low-level vulnerable islands, the sea-level rise trends are much more than worrying and a clear warning for governments to prepare for the inevitable serious coastal erosion and flooding. This will require significant changes to planning laws, in particular set backs, and much more strict rules regarding coastal development and the need to protect our shorelines. While 2017 is not the hottest year on record, depending on the measurements and model it is the second or third. 2016 remains the hottest year on record, but the report reminds readers that the last four years are the hottest since the mid 1800s when records began. While not the hottest in terms of average temperature, 2017 still broke heat records because it is now the hottest year on record in the absence of El Niño, the ocean warming trend that pushes temperatures up. There were also contrasts of extreme precipitation in many places last year and drought events across the world. Greenhouse gases also surged to new highs, with the top three most dangerous greenhouse gases (carbon dioxide, methane and nitrous oxide) all breaking new records. The average carbon dioxide concentration at the Earth’s surface climbed to 405 parts per million, the highest in modern atmospheric measurement as well as in ice core records that date back 800,000 years. The unprecedented heat enveloped the Arctic last year, where land surface temperature hit 2.9°F above the 1981–2010 average, with the area recording the second highest temperatures since records began there in 1900. “Today’s abnormally warm Arctic air and sea surface temperatures have not been observed in the last 2,000 years,” the report stated. Glaciers the world over also shrank for the 38th year in a row, and the situation was no better in the Antarctic, where sea ice remained below average all year. Although the 300-page report makes no predictions, the word “abnormal” appeared at least a dozen times as it documents the statistics relating to temperatures, extreme weather events, droughts and record low ice cover.